Measure two cups of rice and three and a half cups of water and 1 T vinegar into the pot. Let the rice soak for half an hour (up to four hours). Add 1/2 teaspoon of salt and stir. Place the pot over high heat and bring the water to a boil. Turn the heat to medium low and cover pot, leaving the lid slightly off on one side to vent. Cook 10 minutes without stirring. After 10 minutes, check to see if the rice has absorbed all of the water by pulling the rice away from the center with a fork to create a hole. If there is still water, continue cooking until liquid has been absorbed. Remove from heat and place the lid on securely. Allow the rice to stand until cool before making this recipe. Meanwhile, using a sharp knife or julienne tool, prepare the zucchini, carrots and cucumber. Then mash avocado and mix with lemon juice, covering with plastic wrap until ready to spread. Cook, peel and cool shrimp. Drizzle with sesame oil. Crumble 2-3 seaweed sheets in bottom of spring-form pan. Add a thin layer of cucumber. Then press in half of the cooked, cooled, sticky rice. Spread avocado on rice, then add another layer of rice and press gently and evenly (wet fingers and flatten pieces and fill in piece by pieces, as the rice is sticky and will pull the avocado out of position). Add another layer of seaweed, either sheets or shredded in 1/2-inch strips and pressed. Top with another thin layer of cucumber. Add julienned zucchini, then carrots. Sprinkle with flax meal. Top with cooked, whole or chopped shrimp (optional, crabmeat is also okay). Cover with wrap and chill at least 30-minutes before serving. To serve: Unmold, cut into wedges and drizzle with soy or other Asian sauce and serve with wasabi paste and pickled ginger on the side. 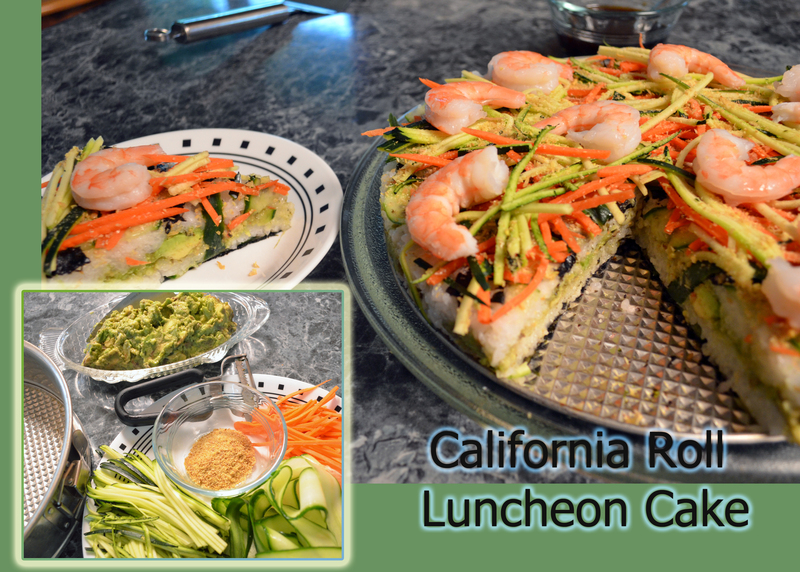 This entry was posted in recipes and tagged California Rol, carrots, crabmeat, cucumber, luncheon dishes, nori, seaweed, shrimp, sticky rice, sweet rice, zucchini. Bookmark the permalink.